At left, Jerry and Dan at Maryland Line, MD. By Mike Calabrese. is a town at the MD/PA border. We did an easy 14 mile day hike from 1.5 miles of the MD/PA border north to the border and then south 12.5 miles to Monkton. This was a very easy, level hike. This trail is great for day hikes all year, biking in the summer and cross country skiing in the winter. 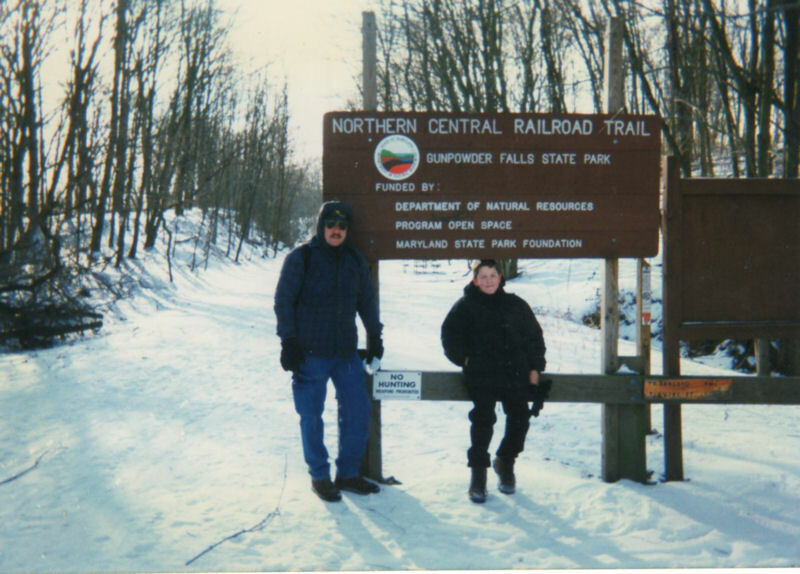 There was snow on the trail this day. We passed 3 or four skiers who passed us once on their original trip, then passed us again on their way back. The scenery was beautifully accented by patches of snow. Dan did very well on this hike considering he was only 12. We called him Lt. Dan after this one. He slept all the way home from Monkton, MD to Manassas, VA. There is no camping along this trail but I'd recommend any section of the Northern Central Railroad Trail for a great day hike.